Orange gradients! Text on paths! Don’t you need computers for those? You may have been born yesterday, but a lot of great stuff has been around since dirt was new, and how it looks now is because of how it looked then. So the question is, in what decade was this Tide design (on the left) on store shelves? Extra credit if you know its debut year. We’ll answer next week. 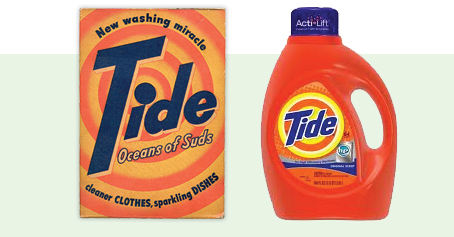 The first really successful household detergent, Tide was invented in 1943 and came to market in 1946. This is its original box. Barely changed in nearly 60 years, Tide’s whirlpool is a textbook study in design excellence. Orange gradients (Hey! Don’t those require computers?) circle around a center (text on a path! ), pulling your eye in and pushing it out at the same time, mimicking — with no animation at all — the mesmerizing action of that new washday miracle, the automatic washing machine. As fresh today as it was then, its look has been widely imitated. Photos courtesy of Proctor & Gamble. P.S. : The responses below were posted before this answer was revealed. 20 Responses to Name that decade! 1947 — a year before I was born. I’ll say 1952. That big dot over the “I” speaks to me. I find it interesting that they’re marketing it as making cleaner clothes and sparkling dishes. I don’t think any of us would consider using our laundry detergent to clean our dishes, or vice-versa. Odd how things change . . .
1946 it was already available in New York stores. Ernst, that wasn’t quite playing fair in a guessing game. 1945 — out with the washboards and the dishwashing gloves, in with the automatic washing appliance machines! Oh, you’re such a “party pooper,” Ernst. But you’re right. My guess was ’46. Way before computers could help with any of those wonderful tricks! Now I’ll go check out your Master Collection. Orange was big in the ’70s. About 1972, to be more exact. That plastic bottle is obviously the current package. So, I’ll stick with 1972. It was just after WWII. I’m guessing 40s or earlier. Sparkling dishes? I would have guessed the early 40s, since I remember seeing that exact box at my aunt’s house. That was way before I knew what graphic design was. I always loved it because it zapped my eye right to the name, and the gradient circles were so curious and cool. Really cool for no computer help. Talk about withstanding the test of time! Something about the font shouts “Art Deco!” to me . . . so I think it was created in the 1930s. Random year guess: 1939. The Soap Wars! Proctor & Gamble vs. Lever Bros. and Colgate. P&G cleaned up with the rollout of a new detergent. They took risks jumping out of their tried-and-true methods of introducing a product into the market, forgoing blind tests for product development. But their orange bullseye came out in October ’46. And Voila! Birth of the Soap Operas!